Classic look and modern features. Logitech outdid itself. The G533 makes an interesting counterpoint to its predecessors. 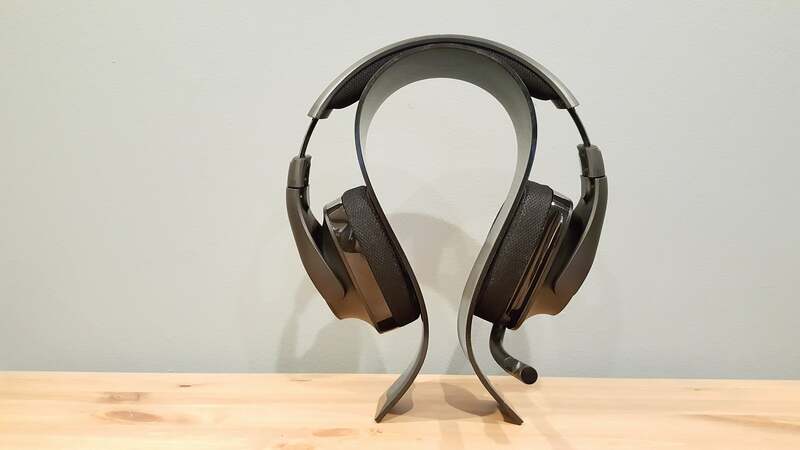 Pull up pictures of 2016’s G633 and G933 headset, the heirs apparent to Logitech’s old G930—bulky air-traffic-controller silhouette, coffin-shaped earcups, RGB lighting, edgy accent decorations. The video game aesthetic. Take all of that and throw it out. What are you left with? 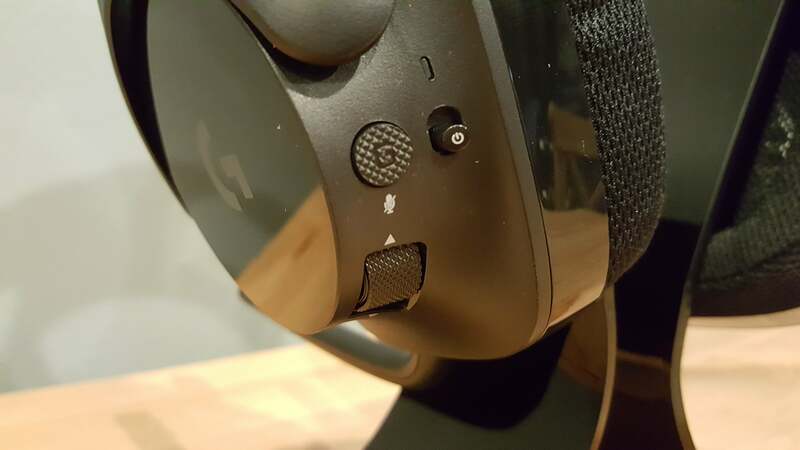 Probably something that looks like Logitech’s new G533. Okay, maybe keep the air-traffic-controller silhouette—the G533 is a bit slimmer than its older siblings but not by much. It’s professional-looking, though. 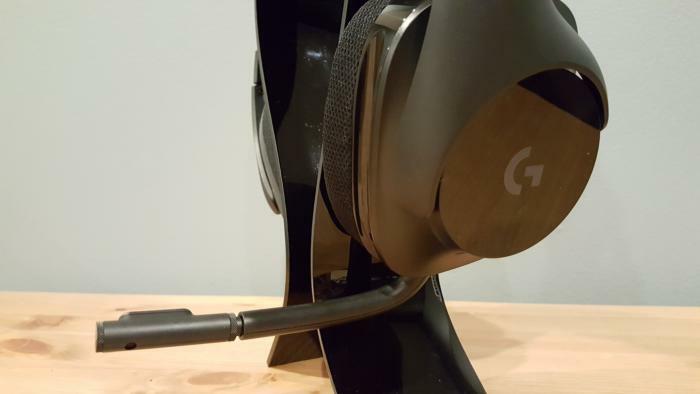 I’m not sure pictures do the G533 justice, because so much of its appeal lies in the details—the way the headband curves around the earcups, or the small groove the microphone tucks back into. The G533 grows on me a bit more each day, with new subtleties revealed even after weeks of use. 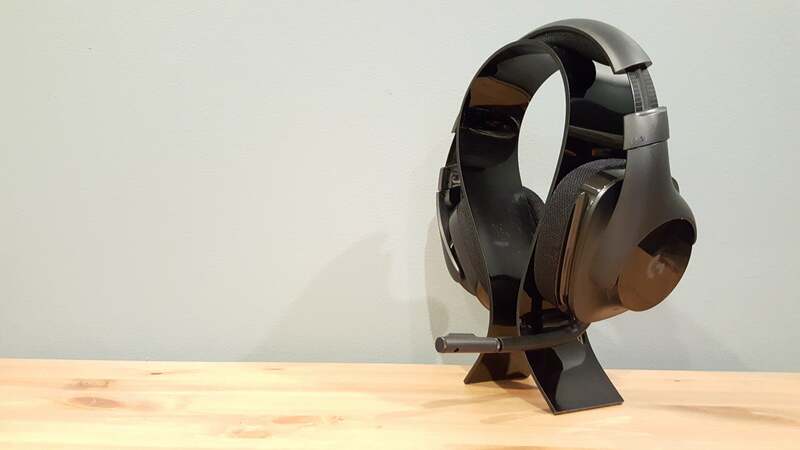 This is the best a Logitech headset has ever looked, I think. Not that I minded the G633/933 pair—they had a certain space-y appeal, and I loved the hidden microphone. 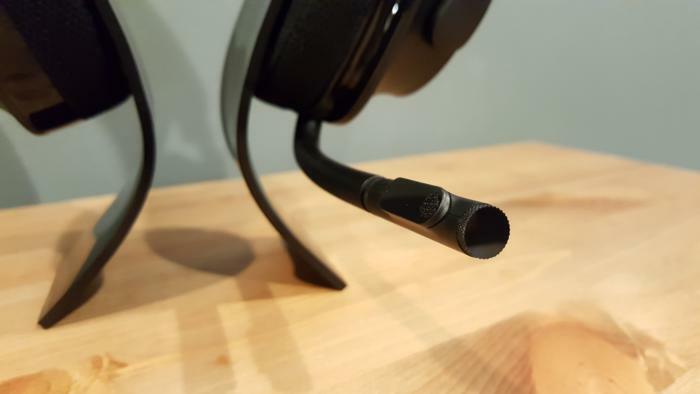 The G533’s microphone is discreet for a gaming headset but not fully ensconced like the G633. But the smooth curves of the G533, the way the matte and piano blacks complement each other, the circular ears—this doesn’t look like the Logitech I’m used to. Razer, maybe, or a more mainstream audio company like Audio-Technica or Sennheiser. But for Logitech, the G533 is another huge step forward aesthetically. The G533 also seems better built than the 633/933. It’s larger but also lighter, and less vice-grip tight than the G633/933. The plastic seems higher-quality too, with less of that “creaky joints” noise the G633/933 had when flexed. The G533’s controls have been simplified a bit compared to the G933, sporting only a power switch, volume roller, a Micro USB port for charging, and a single programmable “G key” that defaults to muting and unmuting the microphone. This is a bit redundant though since the microphone mutes when you flip it up, so I eventually reprogrammed mine using Logitech’s software to turn surround sound on and off, and then later reprogrammed it again to cycle through EQ settings. As I said, the microphone doesn’t retract completely like the G633/933, but it’s otherwise very similar—an inflexible base with an extending (and flexible) boom arm. There’s a single red LED to indicate mute status, though it’s so small and hard to see that it’s basically another argument to just take advantage of the G533’s flip-to-mute capabilities. There’s also a miniature pop filter, which we’ll get to later. Logitech got my hopes up by positioning the G533 as a stripped-down version of the G633/G933, but using the same drivers—the implication being similar audio quality. 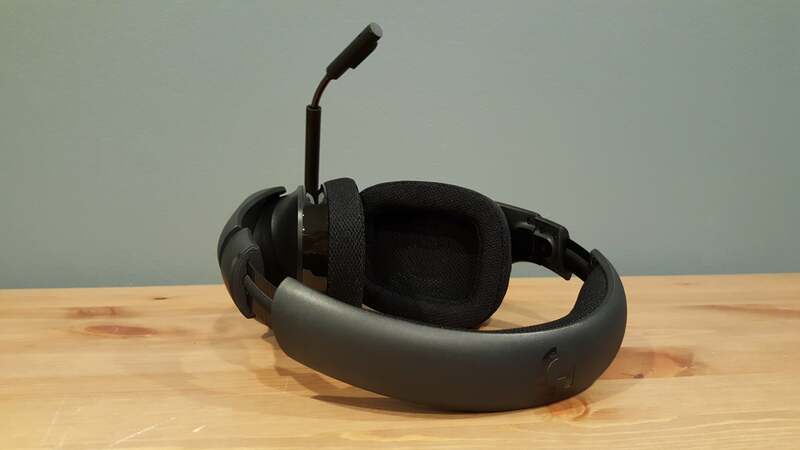 Drivers are only one factor in a headset’s sound though, and after carefully A/B testing the G533 and G933 I think the latter has a slight edge. Not that there’s a huge difference. The pair share Logitech’s passion for flat, studio-esque sound, with the G533 sounding a bit brighter than most competitors right out of the box—mainly because it doesn’t pack the overwhelming bass shoved into most gaming headsets. It’s a good move by Logitech, letting the user EQ to taste instead of nailing a single sound profile to the detriment of all others. Most people will want to boost the bass presence though, and as with the G933, I recommend utilizing the still-stupidly-named Drop the Bass EQ setting in Logitech’s software, then doing some minimal tweaking to taste. That’ll get you closest to settings most people would want for gaming, adding a bit more punch to the mix. But despite the similarities, I maintain that the G933 has the advantage. There’s an immediacy to the G933, a fullness or richness of sound that the G533 doesn’t share. Particularly at lower volumes I’ve found the G533 lacks the oomph of the G933, struggling a bit to provide the same wide sound stage as the G933. Surround-sound performance is even more hit-or-miss. The G533 struggles a bit with stereo sound, but its virtual 7.1 mode sounds positively hollow at times, falling in and out of that awkward echo-chamber effect I associate with bad headset surround. It comes and goes, and with a good surround mix the G533 still sounds fine—in Battlefield 1 for instance. But where I was semi-warm on the G933’s surround, I wouldn’t call it a selling point for the G533. It’s unpleasant more often than not. These are very slight differences, and there are definitely reasons to choose the G533 over its sibling—not only is it cheaper, but it’s also more attractive and more comfortable. Just don’t make the mistake of thinking the G533 and G933 are equivalent simply because they come from the same company and use the same drivers. And as far as industry-wide performance? The G533 is probably the best-sounding wireless headset at this price ($100 on Amazon right now). SteelSeries’s Arctis 7 comes pretty close—it’s definitely a solid alternative. Wireless audio is finally excellent and affordable. We should also take some time to discuss the G533’s unique microphone. Logitech’s fond of highlighting the miniature pop filter on the G533—a small circle made from some sort of foam/mesh hybrid that sits over the mic proper. It’s a much prettier alternative to the standard pop filter, which on headsets usually takes the form of a big foam ball that sits on the end of the boom. Does it work, though? Again, I resorted to testing the G533 against the G933, since both use similar microphone designs aside from the new pop filter. And yes, the G533 does cut down on some of the plosives—those big air-burst noises you sometimes get from “B” and “P” sounds. It works okay, in other words. It’s sort-of gimmicky though. The G533’s microphone still isn’t good enough that you’d want to, say, record a podcast on it, and I don’t think your teammates are really going to notice the lack of plosives. There are also competitors that sound just as good as the G533 (or better) without needing (or calling attention to) a miniaturized pop filter—this is an improvement for Logitech, but not necessarily an industry-wide revolution in the making. If you want a wireless headset for your PC, though? The G533’s my new go-to recommendation. What little it lacks in audio versus the G933 is more than made up for by its cheaper price and more comfortable fit, plus its sleek looks. The Arctis 7 is a bit harder to dismiss—it’s even more comfortable than the G533, but I think the G533’s better audio gives it the edge. Just make sure you only need a PC headset though, because that’s all the G533 does—there’s no phone and officially no console support, whereas the Arctis 7 and G933 support both. That’s the last factor that could steer you towards an alternative, but otherwise the G533 is an excellent wireless option for a bargain of a price. Logitech's G533 doesn't have quite the same breadth of options as the G933, but a more restrained design and a bargain price make this a strong contender for best wireless headset.